Cab Grid is specifically designed as a WordPress plugin (that is – it only currently works with WordPress based websites). It provides a simple grid interface where prices for journeys between two points can be entered. Many cab companies focus on a certain type of journey – such as airport transfers or city tours – and only need specify prices for fairly similar journeys. Cab grid makes it easy for your customers to get prices for simple A to B journeys by providing a simple grid for these prices to be entered. Visitors are shown a simple set of drop down menus allowing them to select a starting location and a destination area. Having selected both areas a price is displayed along with a customisable message. Cab Grid comes in two flavours, ‘Basic‘ and ‘Pro‘. The basic version is free and available from the WordPress Plugin Directory or as a direct download here. The Pro version adds some additional features such as online booking, unlimited areas and additional vehicle types (which are factored into the price calculation), and Paypal online payment integration. The pro version is available to download for a small fee. Cab Grid Pro is also enhanced by complimentary add-on plugins which provide additional features such as Stripe payment processing and online booking management. Cab Grid is developed in the United Kingdom by a small dedicated team with a passion for elegant software solutions. 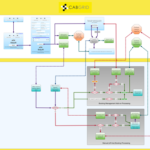 Explore the complete Cab Grid Pro workflow here (PDF).